My love of the railways extends to defending (to a point) the ramshackle approach towards infrastructure and spending in this country. We don’t do it particularly well, and never have. As romantic a view as I’ve always had about them good old days, it doesn’t take long to find contemporary reports from passengers in the 1950s and 1960s that remind us today that British rail has always been crowded, under-funded and bloated with management. The Government department in charge of looking after the whole thing has not been a champion of rail for generations, preferring roads and cars and the motor industry millions that goes with it. Rail has suffered not just because of our love of the car, but because it’s simply far sexier for an MP to sign off another motorway junction than it is a train station. Which is where we find ourselves with the “HS2” scheme to build a new railway line – “the biggest amount of rail infrastructure spending since the Victorians” – from a new hub outside Heathrow into Birmingham, thence to Manchester in the West and Leeds/Sheffield in the East. A highly controversial and contentious piece of infrastructure spending, and exactly the kind of “pay now, yield the results later” long-term planning for which the DfT has a reputation of shunning in normal circumstances. In its hope to poke economic growth with a stick, the DfT has become the main cheerleader for “HS2” and connected purposes, claiming that the line is vital to bring economic growth to the country, bring northern England new employment opportunities and to free up capacity on the creaking, over-capacity WCML. And I’m against “HS2”. Used to be quite neutral, then moved towards being broadly in favour, and now against. Typical LibDem, right? But the case for “HS2” was always quite flimsy and liquid. I just can’t say that it’s looking particularly strong enough now to justify the strength with which so many fingers are crossed. One of the best economic cases against “HS2” comes, oddly enough, from tech-site The Register, which blasts the cost-benefit analysis by using its own level headed approach towards the assumption that the commuters of 20-years hence will be the same as those today. The numbers from the Government side don’t add up very well. The Government assumes that high-speed, long distance travel has to be needed in the 2020s and 2030s because jobs will always be in offices down south, and workers will always be in commuter homes in Solihull and Hazel Grove and Normanton. Link the north with the south, they say, and jobs will be “secured” and growth will be “encouraged”. But what jobs and what growth? There’s always commuters willing to travel, only not from one end of the country to another, and if the percentage of people who require a flight from Manchester to London City Airport is X today, there’s no guarantee that it’ll be “X+” in 2030. As The Register points out, the business traveller who is used to justify the cost is already spending days working from home and hours working en route; what cost analysis exists to prove they’d be happier scrapping all that for a traditional 9-5 in 30 years time? A screenplay for “There Will Be Billions” is being drafted. Work at London Euston alone is estimated today to be somewhere around £1.2 billion and will only go higher. The total spend across the network can only be considerably higher than £2 billion. Public expenditure on the project could be in the area of £900 million by the time of the general election, and there’s almost no chance of Parliamentary Scrutiny outside painfully awkward appearances in front of the Public Accounts Committee. The existing proposed route from London into Birmingham and then beyond has already been altered – at cost – due to the “they’ve used a flat map!” approach to deciding on the route. 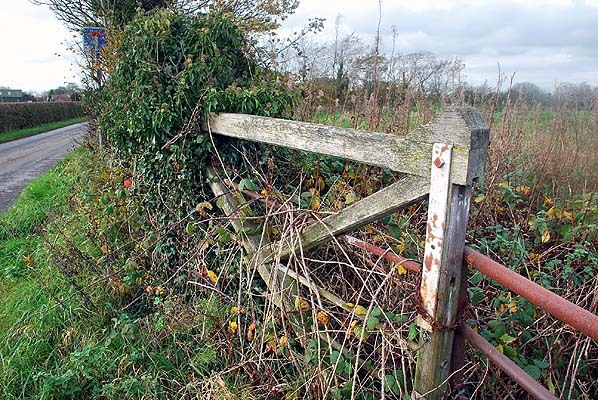 New stations have had to be proposed to placate complaints, much in the same way as unnecessary junctions were added to the M25 to stop people complaining about their back-gardens being ruined in the 1980s. As you might have heard, the M25 still gets congested quite a lot, despite the amount of extra junctions and numerous extensions. “HS2” is exactly the same – lots of new stations (slowing down a supposed High Speed line in the process) without improving the existing network. At the time of writing, the cost/benefit analysis of “HS2” has plummeted to 90p in the pound (source ), and that’s not likely to get any better. Three times as many journeys are into London, not from it, sucking money away from the very outer regions towards the very conurbation Ministers claim needs no further help. Building a new “HS2” station in central Manchester will require existing track to be re-routed, creating a shambles of delay and construction chaos which can only be repeated twenty-fold across every part of its proposed — and as yet unconfirmed — route. We already have some of the highest fares anywhere in Europe, and those can only grow higher and higher. My love of the railways means there’s only one way to save the network from itself. Scrap “HS2” now to focus on specific regional issues. Force franchise holders to update rolling stock, build new stations, and work on expanding the existing lines such as the WCML. Hard love is admitting that the best way to save the thing you love is not to do the obvious. “HS2” is too obvious, and too clearly flawed. To save the railways, it needs abandoning. Early maps of the railways around Preston appear to borrow from primitive drawings of the human circulatory system.Connecting nearby towns with the Industrial powerhouse of the Red Rose County was achieved by way of covering almost every available strip of land with track, ostensibly a result of the numerous rival rail companies battling for the right to serve Preston on their own. Anyhoo, by far the most distinctive part of that early map is the two “pinches” allowing for fairly easy interchange between tracks to the south of the River Ribble. 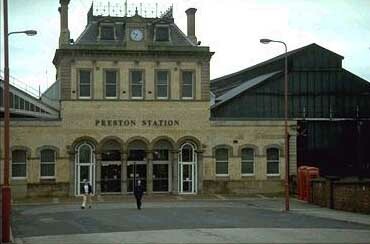 Those form part of the “Preston Junction”, a largely important but now quite forgotten piece of rail infrastructure. Forgive me if any of the images in this post look familiar – every last square inch of the former “Preston Junction” line and its connecting off-shoots have been all but obliterated. What’s left behind – mile after mile of cycle routes and pathways – resemble copy-and-paste levels in cheap computer games, each stretch of tree/weed/mud lined route looking just like the other. It wouldn’t be in character for me not to try make senseof it all, though, so here goes. 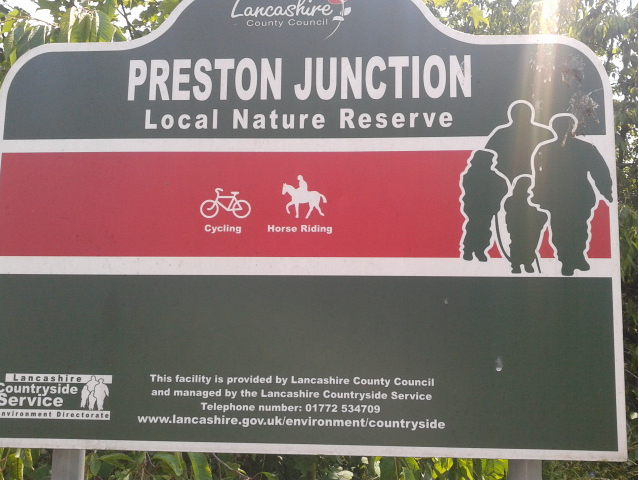 How “Preston Junction” should be advertised…. 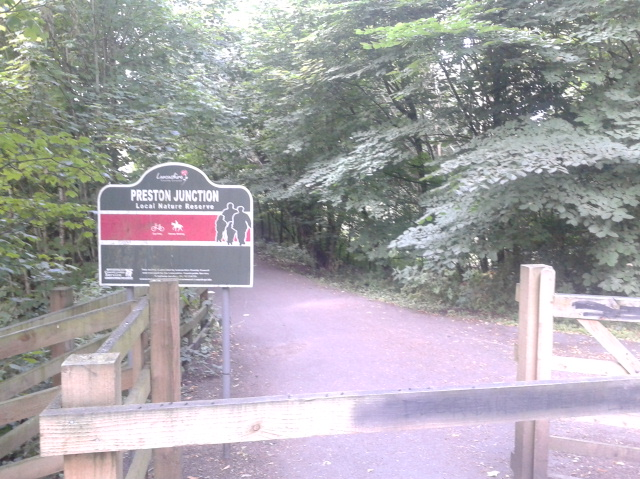 There is no single place at which to start the “Preston Junction ” walk, so maybe I should start in the middle. The complex network of lines can be traced back to just one – the Blackburn-Preston-Farington (Leyland) route constructed in 1846. This would ultimately be consumed into the East Lancashire Railway network that incorporated every route from Liverpool and Ormskirk in the south to the Bury, Burnley and Rawtenstall in the east. Leaving the Tram Route to take its way through the Carrwood Road estate, the right-hand path is the former rail route to Bamber Bridge, with clues to the former use of the path now reduced to rare curiosities such as this. A further three or so minutes along takes you to the Wateringpool Lane “Gas Works Bridge”, which remains in very good nick. This National Cycle Network marker (sounds much better than “National cycle-path”, as I though it was, suggesting a country-wide network of lunatics roaming the streets) is the only plaque/sign/monument to Todd Lane railway station. On the approach to the road itself there are no clues to the former platforms, sidings, track alignment, nothing. 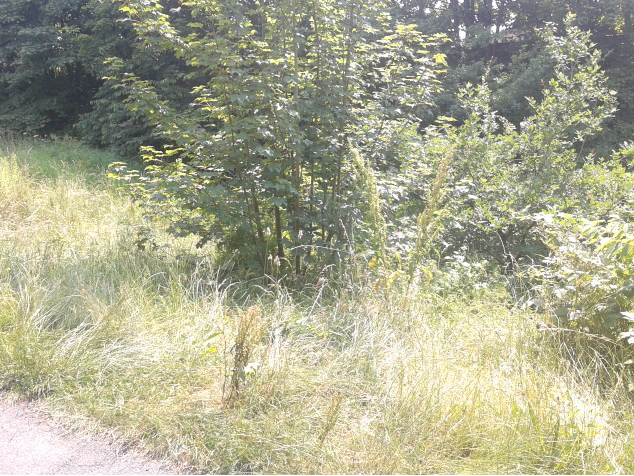 Just lots of overgrown “nature reserve” plants and weeds. To break up the mass/mesh of nature gone back to…nature…there’s a brook of some sort hidden underneath more overgrown plantation. From the Brownedge Lane bridge, the spur to Todd Lane looks impassable. Not so. The route is clearly underused (if indeed it’s used at all, even with a few clues of human/teenage use as a ground to dump bottles and cans, there was very scant evidence of it being popular). 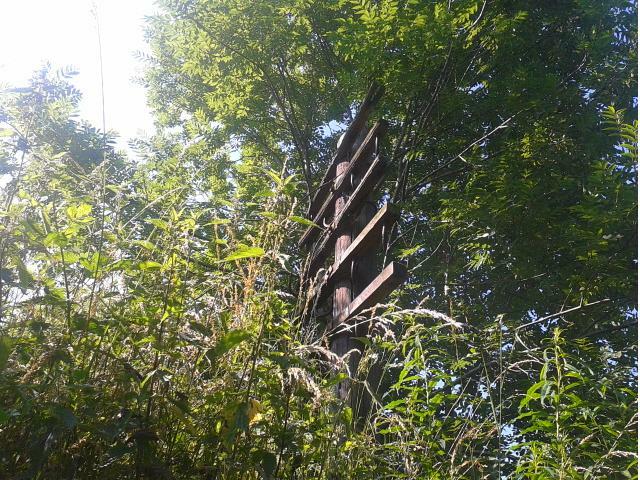 I’m not going to claim knowledge about what exactly this is – a boundary marker of some sort? Or remains of original track? Answers please. This route takes only a few minutes, is very uneven underfoot – no bland tarmac here, or indeed for that matter anything, just ballast and stones and weeds and mysterious parallel lines. 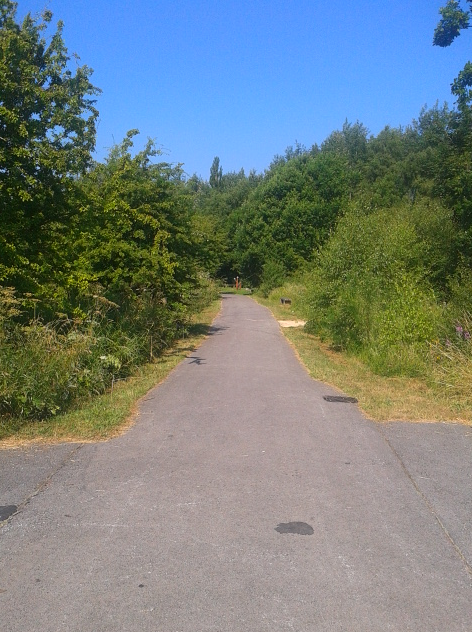 The walk from this curve to Bamber Bridge is unremarkable, and not just because the destination itself is, well, just that. The route comes to a sudden stop because of the A6 London Way, with the original alignment of the railway surviving as the B5257 roundabout slip-road. Don’t say things get boring around here, folks. The view from Bamber Bridge station, had I taken it, would have shown where the two parts joined together. The Google Maps friend is back again, as it shows how the Brownedge Road part meets the scrapped railway lines overlooking Irongate, home to Bamber Bridge FC. In summary then, the route from Preston to Bamber Bridge along Todd Lane has almost no indications of its former route, other than the tucked-away Lostock Hall pathway. Now for some cross-blog pollination. The West Lancashire line from Preston to Southport is one I’ve walked and written about before. Here’s how to get from there (ish) to Preston Junction (more or less). 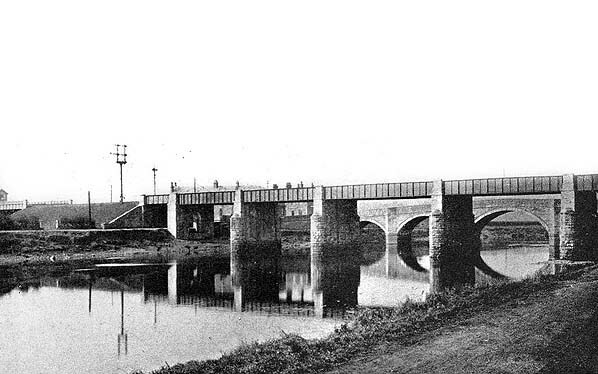 The two junctions at east and west – I suppose “Lancashire Bra Straps” is a bit tasteless but you get the idea – represent the connections needed to link towns to the south of Preston without going over the Ribble and into the town’s central station. Looking at traffic congestion on the roads, let alone the WCML today, it’s sad that these lines were disposed of so easily. The walk along these curves and junctions begins with a walk towards the grand (if now sadly tumble-down) railway bridge over the Ribble. 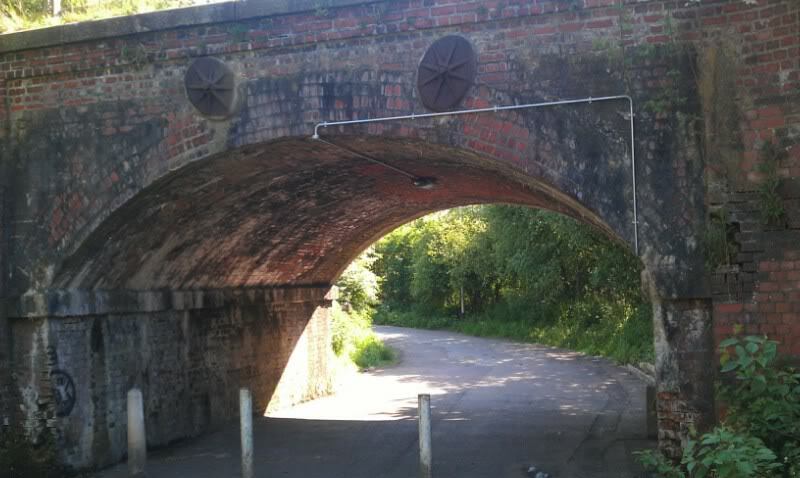 Lancashire County Council has undertaken a massive regeneration scheme around this bridge, converting the overgrown and abandoned trackbed into a cyclepath, bringing to an end Vicar’s Bridge in the process. Not only has this opened up the path (and removed in situ track), it’s reduced by a factor of hypergazillion the number of dodgy men rubbing themselves against oak trees. Win-win. This shouldn’t shock you, but crossing the bridge takes you to another nondescript tarmac’d path. At least along this part of the walk, there’s a couple of historic artifacts still in place. 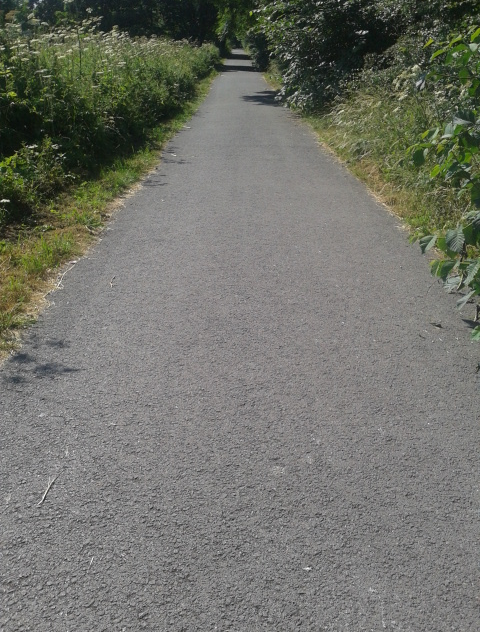 And that’s it, because to follow the curve around towards Penwortham, it’s back to nondescript tarmac. The “Penwortham Spur”, if that’s the formal name is marked by these bizarre pieces of public art. I’ve no idea what they represent. 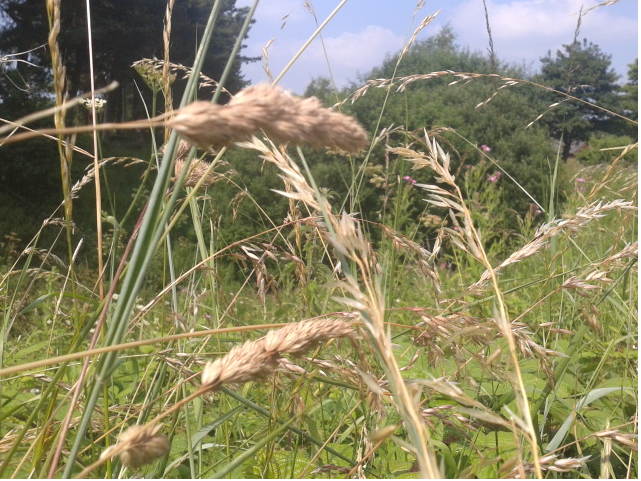 These bendy-metal-eye stalks turn up at the end of the junction, which is otherwise just another stretch of…you guessed it.. The walk to Penwortham uncovers a piece of railway infrastructure – or so I think – on the track which leads onto Middleforth Green, a piece of suburbia on the way to Lostock Hall. 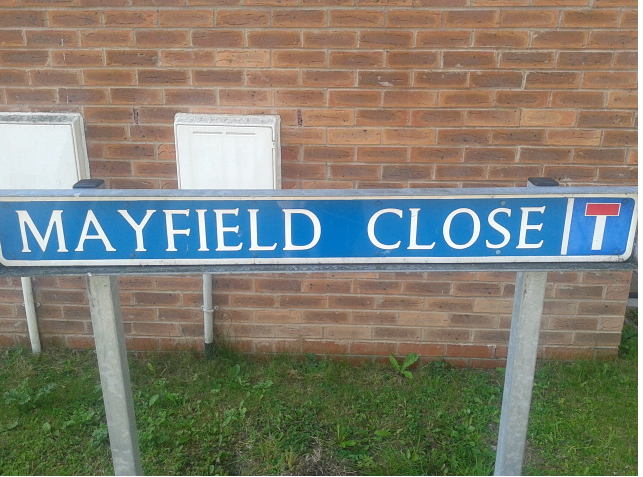 (All roads lead to Lostock Hall, you notice). As you can see from the map, the two junctions/interchanges have bridges ‘in situ’, both of which do their best to appear bleak and imposing even at noon. There are two final jigsaw pieces to the “Preston Junction” puzzle; the part which connects these two sweeping and swirling rail-lines to the West Lancashire line to Southport (which I followed), and the line attaching Croston to Lostock Hall just south of Longton (which I did not). 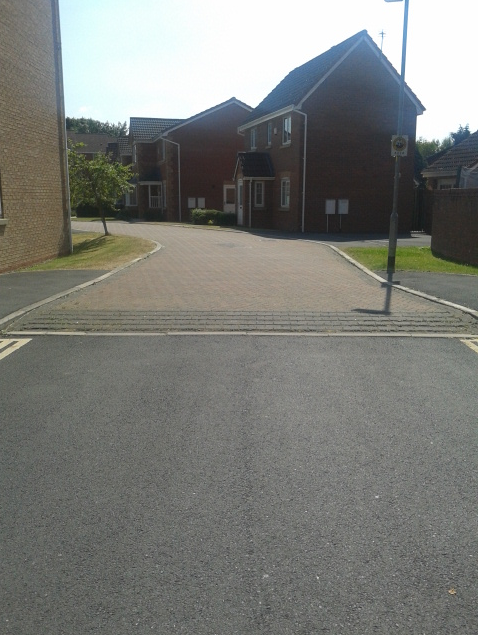 The missing segment through Penwortham is now a housing development, and a typical example of the bland rabbit warren estate which is squeezed into any available space. The street doesn’t even have a name related to the former use of the alignment on which it now rests, which seems an opportunity lost. So this is where the railway would have taken passengers to or from Southport/Blackburn, with its bland new build development name. The road looks out onto very familiar looking brickwork which also provides a great clue to just how substantial the railway infrastructure was before it was closed down. That’s one heck of a size. The Park Road estate rests in the middle of the “Penwortham Triangle”, where my previous walk began on the opposite side. The name “Penwortham Triangle” has an echo where the bland pathways are marked by bendy-freaky-metal-glass-alien-art, namely “Whitehouse Triangle” on the maps of the time. You should be able to see that map on the Google image above. With numerous generations passed since any trains did, it’s little surprise that the conversion of rail to dog walker paradise has stripped so much land of so much history. 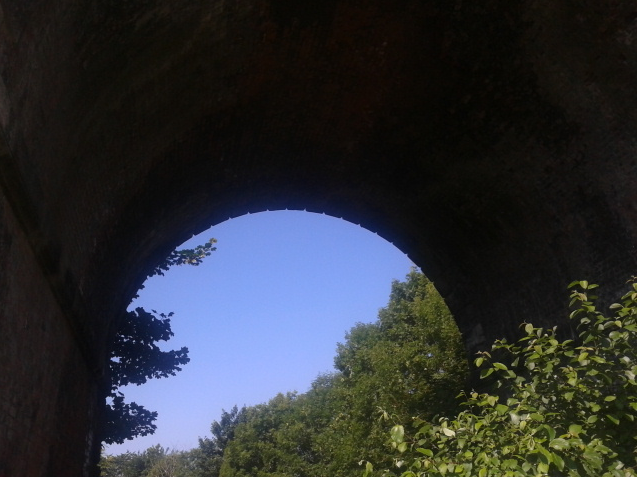 The lack of many clues to the past beyond aerial photographs reflects the extent to which the past has been truly left behind, leaving only bridges and brick-work as hints to the history and heritage of Lancashire. I would recommend having a mooch around these parts whilst the weather stays good – maybe you could tell me what the modern art things are supposed to represent? Preston and Southport are approximately 16 miles apart, a greater distance than the width of Greater Manchester at its widest point, so of course transport between the two is only marginally better than that which exists between Kirkwall and Cowes. Most folk venture along the A59, which gets blocked around Penwortham for the school run and continues as Lancashire’s longest traffic-jam until the 5pm commute chugs along in the opposite direction. 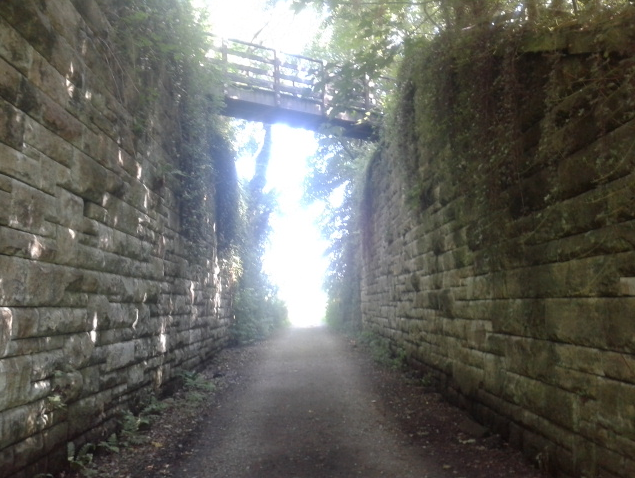 Between the two used to run the West Lancashire railway, connecting an outer bit of the latter with an outer bit of the former. Most Prestonians probably don’t realise that the West Lancashire railway ran not to the main railway station on Butler Street, but to a smaller station at the bottom of Fishergate Hill. Not only did my shoes take a bashing, it became very clear, very quickly, that the intervening 48 years have not been kind to any signs of what might have once carried passengers and food across the Lancashire Marsh Towns. My trusty well-thumbed road atlas proved to be only half-way decent to getting the best out of the walk, and in any case the route has long since been taken over by housing, farmers and business-parks, so walking the exact route was a non-starter. My aim, therefore, was to venture as close to the line as possible to find the location of each West Lancashire Station. The two parts of the journey divide the walk into halves – Preston to the River Douglas, and then the Douglas to Southport. Now a GP surgery – and one which was under threat from closure – the site of Preston’s short-lived West Lancashire railway station shows no indication of its former life. 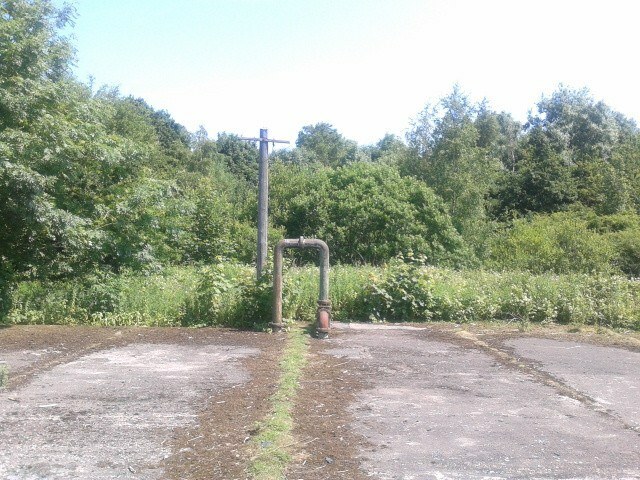 Indeed whilst Google Maps is pretty good at showing the footprint of former industry there’s not much on the ground to indicate where the railway used to run. The homes around this part of Preston are a mix of Victorian and Georgian houses of considerable size and value, some of which are owned by families whilst others have been converted for houseshares and students. There’s a new-build apartment development here now, too, minimalist apartments with thin walls and external letter boxes as per. Separating Broadgate from Riverside is dog-walking greenery which was once the West Lancs line, though its distinctive shape can only be appreciated as such from the air; at street level it’s two barely covered footpaths twisting and turning through trees allowed to grow where the railway used to be. Follow the line across the Ribble and you’ll see the distinctive stone columns which used to carry the line to Penwortham. 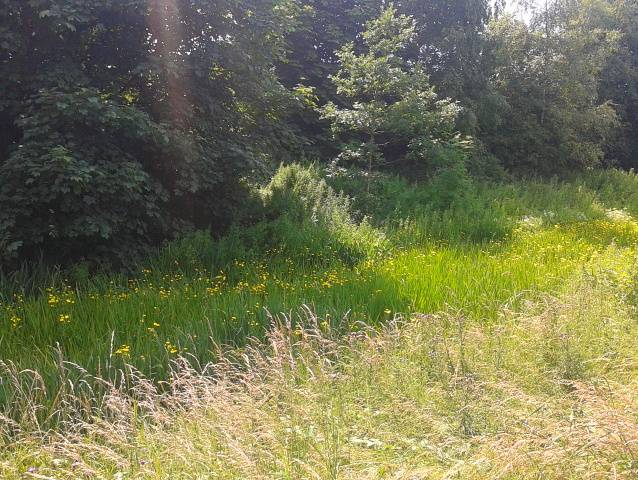 This leads across to “The Penwortham Triangle”, now partly converted as a cycle-path and “natural history trail” (“we’ve neglected this for years and now claim the weeds, wildflowers and damaged seating offer a rustic charm”). As you might expect, the trackbed has been reclaimed by nature in all its forms – trees of various shapes, widths and girths, bushes, bracken and assorted suchlikes. “Penwortham” on your address can mean the difference between “your house is a decent investment” and “your house is a reasonable price.” It’s the largest town council in England, and is best described as being split between Higher Penwortham (comfy suburbia, 80s/90s housing boom new build on rabbit warren estates, gravel drives, boutiques amongst the Co-op and Spar), and Lower Penwortham (post-war housing sprawl, terraced streets, chippy, Booze Brothers). 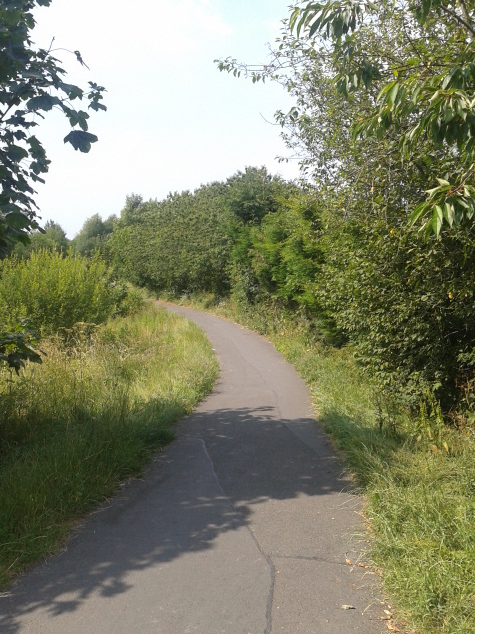 The cyclepath which takes me to the site of Cop Lane station runs parallel to the embankment and track-bed of the West Lancs line, scrambling up to which is a strife not worth taking (i.e., it was muddy and it really is very, very steep). There’s not actually much to see here other than the allotments on one side and the embankment on the other, with one public footpath running north/south towards a residential estate bordered by the distinctive shell of what would have been a bridge. Walk, don’t run. Or cycle. But don’t run. One long stroll and crossing of “Golden Way” later, I’m on Cop Lane, where the station and all signs of it have been long since obliterated underneath the carriageways. As Beeching predicted would happen at the time, buses now run in every direction at regular intervals, to and from Preston in a loop and at the far end of the road Stagecoach services to Southport along the A59. As the lazy part of me wouldn’t mind following this A-road to New Longton, the ‘rules’ I’m making up as I go along mean my route has to take as close a line as possible to the original route, so away from the A-road I go to the back-streets and rural parts. Opened originally as “Howick” and “Hutton and Howick”, the station at New Longton got another name change not long before its destruction. The walk I take as close to the line of the railway shows homes replaced by farm-houses, and the distinct smell of manure following the numerous tractors driving around in all directions. With the built-up commuter towns behind me, the difference is marked and immediate, as this is the start of the journey into West Lancashire’s main economy source – cabbages, and a lot of them. New Longton is far more of a enlarged Middle England suburbia than it used to be, with the large homes looking out towards fields giving way to rabbit warren estates and post-war sprawl. I spot, easily enough, “Station Cottage”, the level-crossing keeper’s place of residence until the line was closed in the 1960s, and on the way there I am served at the Post Office by a man wearing a novelty bow-tie, lights flashing in sequence. They tend to have these sorts of people in villages. have been the line on its approach into Longton. Aerial maps show the end of the street abutting the track bed. house which must have only been built through lottery winnings. …crossing the A59 by taking a deep breath and just going for it. No traffic lights here, you see, just a fence with a gap in the middle. The further I go along Chapel Lane, the wider the gap between me and the line, which is now running at a slight curve away from Longton “proper”. This is one of those “cause and effect” questions – has Longton always been destined to grow away from the location of its railway station or did it happen that way when the line was closed? Certainly Longton exists in far greater area and population off Chapel Lane than it does where the line and station used to be, with a row of shops and pubs on both sides of the A59. 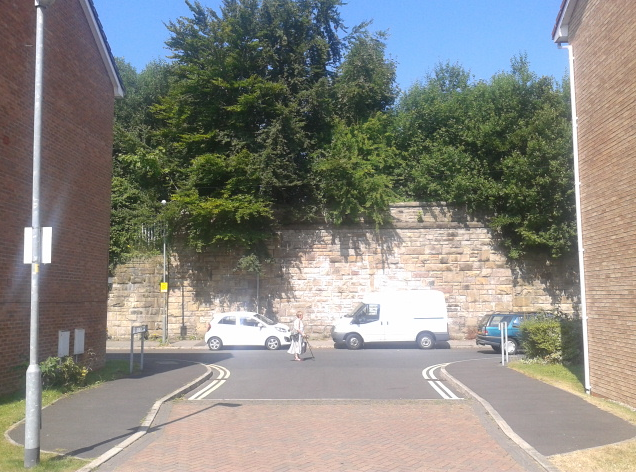 What does still exist at what was Longton Bridge is the vast stone walls which used to carry the line over the road, with a new housing estate “Bentley Park” covering the station site itself. The final station on my wander around looking for any remaining clues of the West Lancs Line is the first of the genuinely remote rural outposts, which requires a long walk along what is still called “Station Road”, although there’s very few remnants of this nowadays. 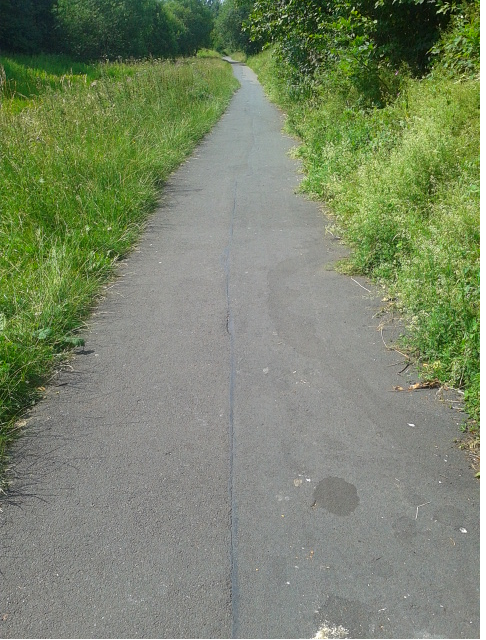 My walk has to follow the line as far as possible, though in this case, it’s not easy to do so, and I find myself following the bus route through near-by Walmer Bridge. 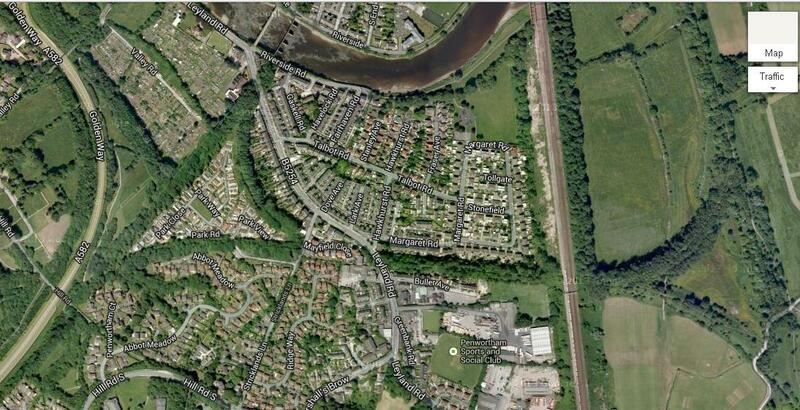 Here’s a population centre which looks like a crossbow running off the main A-road, with both of its pubs now closed. Whilst it might have been sensible to name the station as “Walmer Bridge”, it is after the local parish of Hoole (“shed”) from which it took its name. I notice that there are fences and rubble here which might suggest the remote location has saved more than most others, though only the fences are actually of the time, with the level crossing fences the most obvious. Not quite so obvious a clue to the nature of Hoole is the gin bottle I find nestled in the hedgerow. I take the number 2 bus back home, which meanders through and around all the places which used to have a train station. As has always been the case, the bus stops and starts at almost every bus stop, with people of all ages using it to get into Preston. If Beeching had designed his consolidation process with a view to promote bus travel, then at least here it’s worked. It’s notable that the greatest sign of the line which used to be here remains in greater clarity though Google Maps rather than on the ground. If Penwortham is anything, it’s a town in need of access to the rail network, and that’s now impossible to ever achieve. Whilst car and bus travel continue to clog up the arteries, the short-termism of Beeching is shown up for the daftness it was. Rail enthusiasts might get nostalgic about reopening lines, though there should be some realism these days. Hoole, for example, is unlikely to justify Network Rail’s business case criteria, even if nearby students to Hutton Grammar and coppers from Lancashire police HQ were included. Stagecoach probably do very well running three – count them – bus services along the Southport route, visiting all the places where stations used to be, although like my walk, the route is somewhat extended, takes longer in time and costs far more to complete. At its height, the route would enable passengers to travel to Blackburn without changing trains. To make the same train journey now from Southport requires changing at Bolton, or changing at Wigan and then Bolton, or maybe Burscough and Preston. With the advance in years, some steps have been quite clearly backwards. The next stage of my journey takes me from the River Douglas to Southport…. If you’re the kind of person who enjoys camping under starlight whilst eating potatoes cooked in lager cans (or for that matter, actual proper food served in a castle with actual proper beds), there’s a great option for you in the Small Isles off the west coast of Scotland, a ferry ride away from Mallaig. The most highly recommended way to travel here is via the West Highland line, regarded as one of the most scenic railway journeys in the United Kingdom, with a line which twists and turns around, and occasionally through, the mountains of northern Scotland, involving negotiating Ranoch Moor and Corrour, the highest and most remote railway station in the country. It’s not headline news to learn that this line is incredibly popular with tourists travelling from Glasgow through Fort William to either Oban or Mallaig, whilst the intermediate stations enjoy sporadic visitor numbers. If Tim Leunig, chief economist at CentreForum (no, me neither) had his way, lines such as West Highland and stations such as Spean Bridge, Bridge of Orchy and Upper Tyndrum would be shut down for purely economic purposes. Leunig, you see, wants the Government to close down 30% of Britain’s railway stations. His reasoning is pure Beeching, and purely cold economics in the grand tradition of conservatives for whom monetary concern trumps everything else. In the context of serious concern about the cost of the railways in this country, it’s no surprise to see both political wings unleash their most extreme responses – nationalisation from the left, harsh economic penalties from the right. As usual, it’s hopeless finding answers from either extreme, for the answers lie somewhere in the middle. Leunig, and many who support him, has drawn the wrong conclusions from his available evidence through what seems to be an ignorance about the realities of rail travel in the UK. This might come as little surprise too – anyone who deals with numbers over experience can’t be entirely trusted to understand the consequence of their mathematics. Let’s deal with the West Highland Line. If these proposals were ever to be introduced, the line would barely survive, with it’s 20-odd station stops between Glasgow Queen Street and Mallaig reduced to just three stations; Dumbarton, Fort William and Mallaig itself. Any budding tourist trap, from cafes to walking pursuit organisations, would shut down overnight. Whatever pressure is already forced onto authorities to supply bus or coach links to Scotland’s most remote villages would be increased to such perverse levels that the character in 50 Shades of Grey would feel a bit uneasy. From being one of the UK’s best loved rail routes, the WHL would be reduced to a high-speed tourist trap, hurtling local people and holiday-makers alike through the Highlands in a fast-forward version of a promotional video. Taken as a whole, the proposal would rob communities of their links to bigger cities, from which follows employment and leisure opportunities. “Let the buses take the strain” made some form of twisted sense in the days of Beeching, who viewed the railways as hopelessly out-dated and out-moded. Had Beeching and his successors been allowed to continue, the UK would be unlike any other country in the developed world, lacking railways out to the suburbs, tourist towns and local communities, employing instead two unconnected super-highway rail lines connecting no more than five major cities together. It’d be impossible to even cross Birmingham, with no link between one side and the other. If you didn’t have a car, or maybe a helicopter, the railways would be inaccessible to you, forever. Londoners could not visit friends or family in any of the Home Counties immediately surrounding their city, whilst enjoying a rapid high speed ride to Leeds, the first and only English station stop between them and Edinburgh. Leunig calls leaving stations open as “a preposterous waste of money”. He doesn’t offer much in the way of figures for this, though this might be because there’s little evidence to suggest closing a station is no more affordable than allowing passengers to board a train which might only make one visit every hour. There are bus services to parts of Preston, where I live, less frequent than train services to Lostock Hall, with both realities no more able to ‘disprove’ the worth of the other than any comparison which might be made between the footfall enjoyed by McDonalds and the independent cafe three streets away. In any case, keeping a station open is actually less difficult and cheaper than closing one down, as the legal process of closing down railway stations is so complicated that they’re invariably kept open. “Parliamentary trains”, so called because of the need to clumsily circumnavigate various Railway Acts, are maintained by TOCs to provide a rudimentary service in place of spending the money to remove all trains completely. The 30% plan would, therefore, cost more money than Leunig realises. To slash so many stations from the network would require TOCs to run hundreds of make-believe trains around the country, often unadvertised deliberately, as part of a ludicrous game of ‘efficiency savings top trumps’. Beeching transformed our rail network, and did so in all the worst possible ways you could imagine. It’s beyond bizarre that anyone could consider it appropriate to use Beeching as a blueprint for further reforms, a kind of abusive partner-meets-Stockholm syndrome set-up, drawn from years of feeling turned on whenever anybody mentions “Thatcher”, “tell Sid” or “it’s a replacement bus service leaving from the station forecourt”. What we should be doing – well, what Conservatives should be doing at the very least – is encouraging building MORE stations in MORE locations, adding increased numbers of blobs on rail-maps to allow people greater access to the existing network. George Osborne’s infrastructure plan allowed for the construction of just two new stations across the whole of England – Apperley Bridge and Kirkstall Forge in Yorkshire. He should have allowed the construction of dozens, and then hundreds, and then yet more, bringing people who live in the outcrops and environs the opportunity to access the national network. More construction jobs, more income generated in parts of our cities and major towns which often feel ‘isolated’ from big bang projects, more opportunities for businesses to recruit from a wider net. In case you thought that your eyes deceived you, Leunig also recommends the introduction of a ‘standing class’ London train, in which people would pay a £1 fare for the right to have no seats at all, as standard. This policy is all manner of bonkers, for reasons of health and safety as well as common human decency, though it’s also worth noting that the Railway Regulation Act 1844 ensured that passengers could no longer be subjected to such inhumane treatment by rail companies. What riles me more than anything related to the railway issue is just how repetitive these arguments have become. Whilst the country umms and aahs about building a single new station, or electrifying one length of track, Spain continues to build the longest metro line in Europe, and renowned rail networks in Germany and Italy continue to expand for much less money than it could ever be done here. We’re a backward, slow, ponderous country whose attitude to infrastructure projects is stuck in the steam age. Anybody who considers it correct that we should assist our railway service by slashing it to pieces deserves locking in a waiting room over night without even a Select vending machine for company.